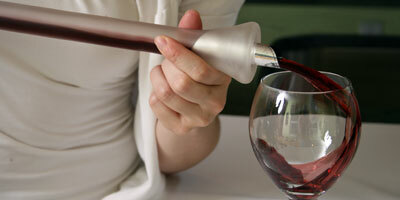 Red wines and some white wines benefit greatly from decanting which helps unlock the hidden flavors and aromas. Such practicality is not why Corked Bat Collection decanters were created. Corked Bat glass decanters look great on display, both empty and filled with red or white wine -- or even candy. Corked Bats are instantly the conversation of any party, and are fun to pour. Plus, they feel like a regulation bat when you swing them, though we would never dare recommend you do that! 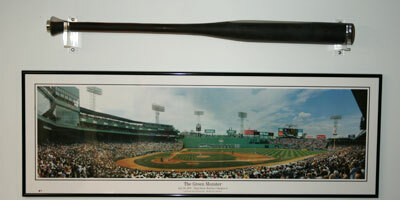 Glass decanter baseball bats from The Corked Bat Collection are the same specifications of an adult baseball bat (32.5" long; 2 1/8" barrel) and fit in a standard bat rack. The bat is hollow, yet thick enough to be sturdy. 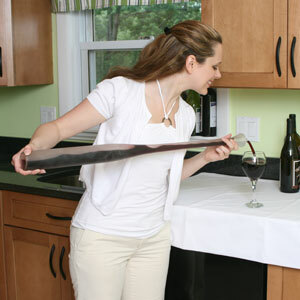 Exactly 750ml of wine fits in the Corked Bat, which is the amount of wine held in a standard bottle. Each Corked Bat comes supplied with two pouring spouts. 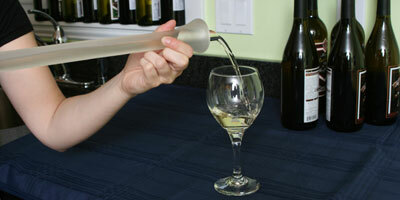 Simply roll up a spout, insert it in the wine bottle and fill the Corked Bat. 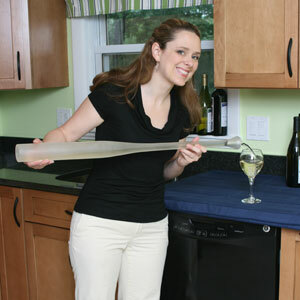 Use the other spout to fit into the Corked Bat so you can easily and neatly pour from the Corked Bat into a wine glass. 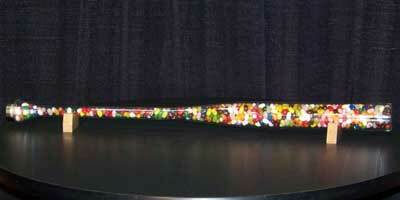 They also display candy nicely, such as M&M's, jelly beans or candy corns. Store it on your wall, in your kitchen, or show it off to your friends. Corked bats are perfect as birthday gifts for your husband, Father's Day gifts for dad, or a showing of appreciation for your son's baseball coach or wine enthusiast friend. They are also perfect as corporate gifts. Get one to store a Chardonnay and another for a Cabernet. They make a great set! Or fill them with Jelly Beans, M&M's or Candy Corns for your child's party or at a baby shower! Purchase a Corked Bat today!